We were recently incredibly fortunate to be invited to an intimate lunch in Hong Kong to celebrate the release of the 41 year old 1974 Benromach, recently released in extremely limited numbers. 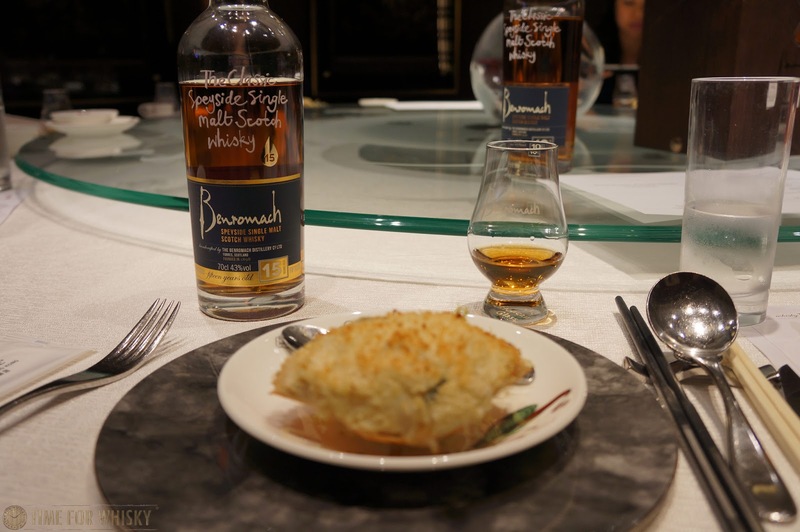 Special guest / host for the lunch was Richard Urquhart of Gordon & Macphail / Benromach. Richard's business card might refer to him as "Export Regional Sales Manager", but as a member of the 4th generation of the Urquhart family (who founded Gordon & Macphail over 120 years ago), you'd be hard-pressed to find a better brand ambassador. A man more passionate about a whisky brand you'll likely not find - unsurprising when said brand is ingrained in your family's heritage. 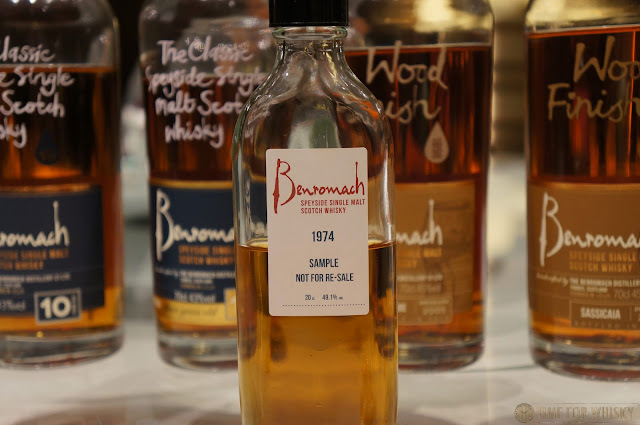 I first became familiar with Benromach back in 2013 at a tasting in Sydney, so it was nice to revisit the whiskies (and a few new ones) and see if / how my perception had changed, and also to visit a few new releases. 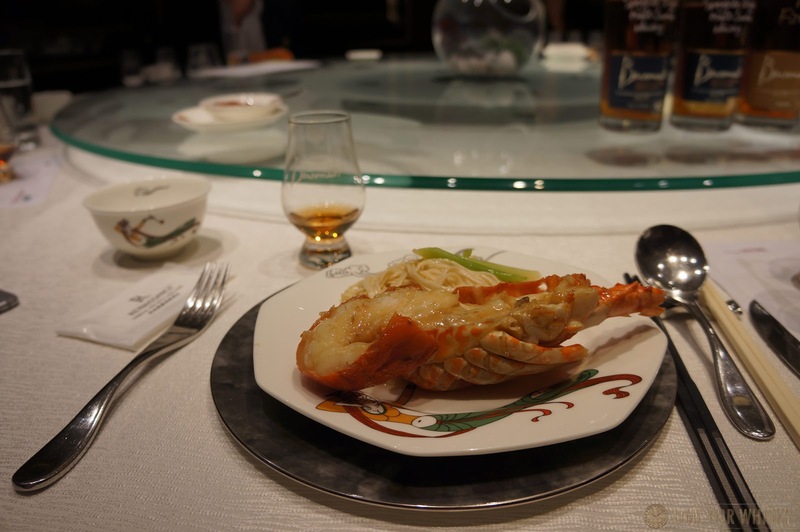 To do so over a fantastic 8 course banquet at Dynasty Restaurant at the Harbourview Hotel was the icing on the cake. Richard introduced us to the distillery (which Gordon & Macphail purchased in 1993 and reopened in 1998) with a quick video, then gave us a deeper insight into what it's like to be part of such a prolific whisky family. 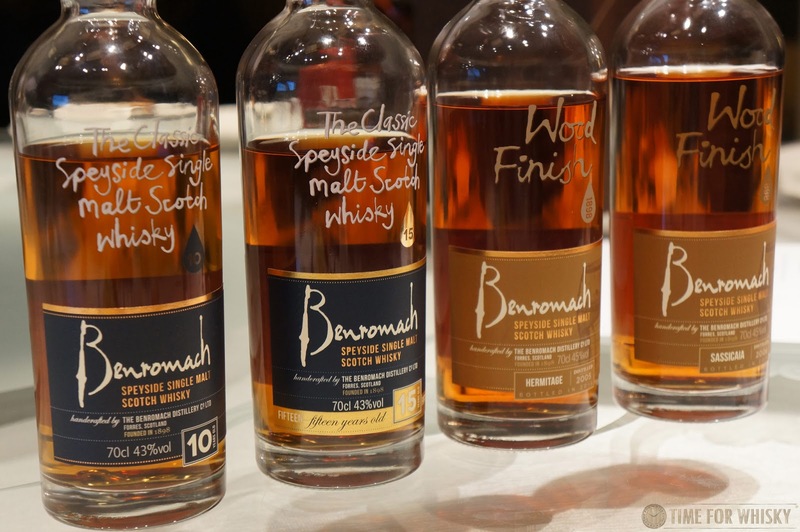 Interesting note: no special treatment for family members - Richard began life at Benromach sweeping the floors! 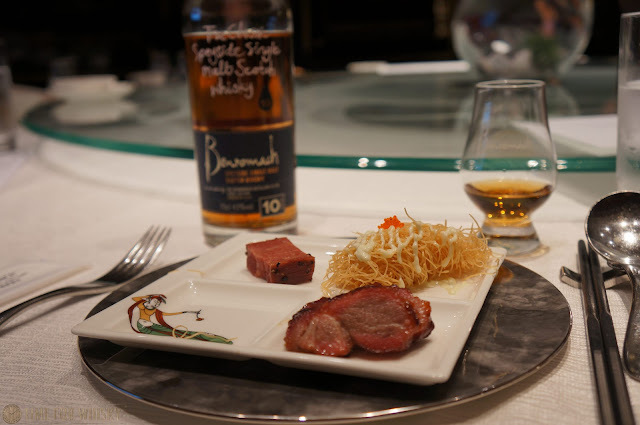 Lunch kicked off with Benromach 10yo which, I have to be honest, I remember being good, but not this good! An absolutely wonderful "entry level" Speysider - with plenty of sherry influence whilst still maintaining the light and elegant notes you expect from a Speyside whisky. Crème brûlée, citrus, and even a little ginger were the dominant notes. 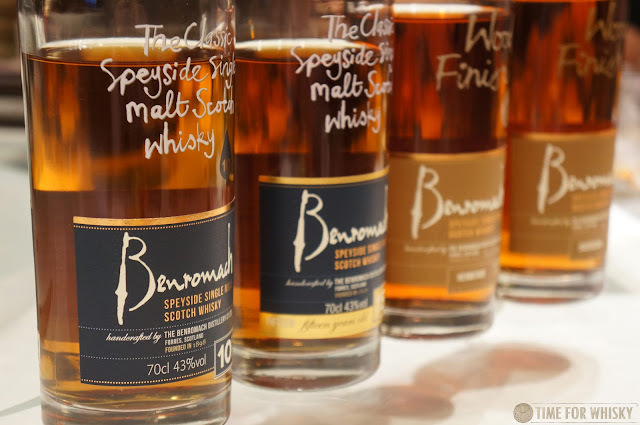 Matured 80% in ex-Bourbon and 20% in ex-Sherry, the whisky is later finished in a 1st fill ex-Oloroso cask. It works wonderfully, and matched well with our first dish too - Bread candy rolled with scallop and mango, barbecued pork, salty ox-tongue with black pepper. 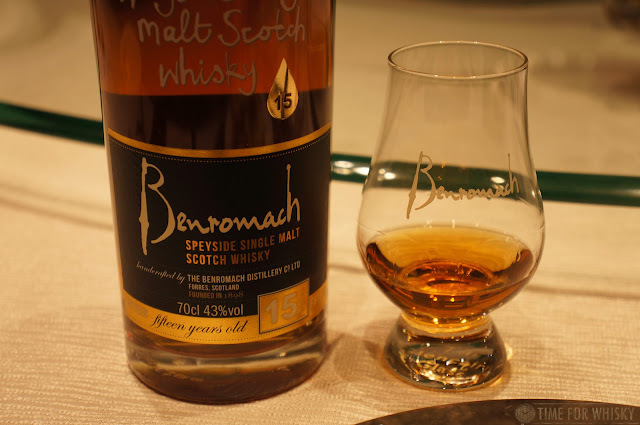 Next was Benromach 15yo, which has the same make-up as the 10yo, but enjoys a 5 year finish in those Oloroso casks. With a more prominent sherry influence, this was a beautifully rounded dram with a creaminess which complimented the Baked crab shell stuffed with crab meat and onion nicely, but was in no way a one-dimensional sherry bomb. A very elegant dram. Our next whisky was from Benromach's "Wood Finish" range - the Hermitage, distilled in 2005, matured in 1st fill ex-Bourbon barrels, finished for 2 years in French wine casks from Northern Rhône, and bottled at 45%. The wine influence was noticeable here, with an earthy, flinty, almost dusty note along with a vanilla creaminess no doubt imparted by the 1st fill bourbon barrels. Another lovely whisky, which we really enjoyed with Sautéed diced wagyu beef tenderloin with asparagus. 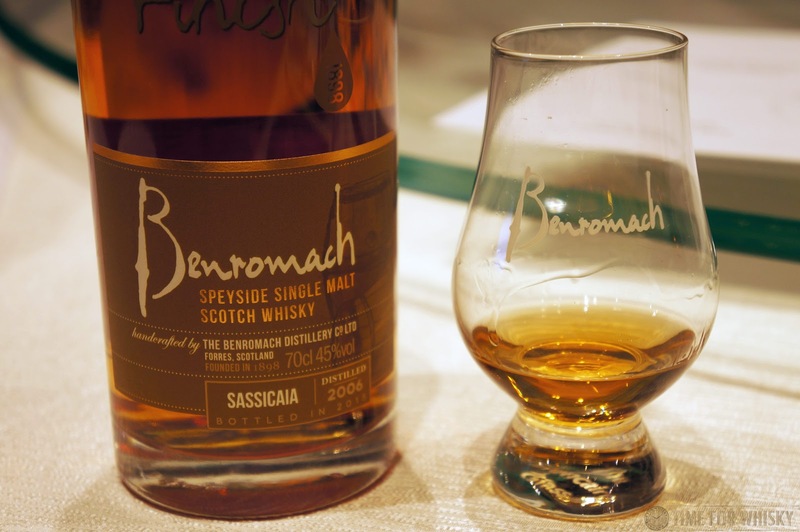 That was supposed to be it for the "regular" line up, however Howard of Fine Vintage Hong Kong (Benromach's distributor here) had brought along his own bottle of Benromach Sassicaia, and was kind enough to share it with us. As his favourite in the line-up, Howard joked that he regularly carries a bottle around (hey, that's an idea we can get behind). It's a tough call between the 15yo and the Sassicaia, so I'll call it even - both are wonderful drams. With a pinkish yellow gold hue and notes of berries, lemon, vanilla cream and key lime pie on the nose and palate, the wine finish became most noticeable on the finish, which was slightly earthy and vegetive. A complex and delicious whisky, very enjoyable with Baked fresh lobster in supreme sauce with e-fu noodles. 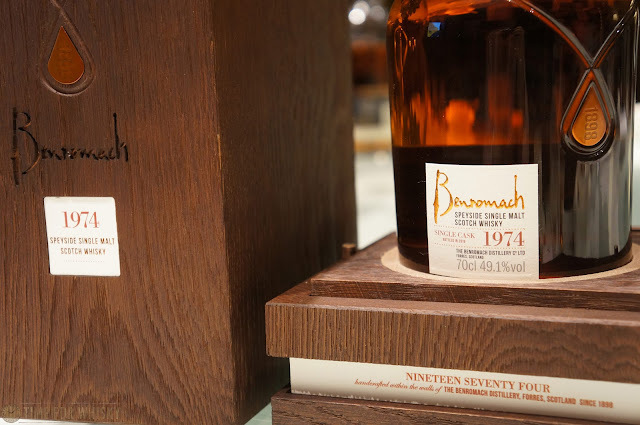 ...all of which led us to the main event - our very special tasting of the Benromach 1974. With only 3 bottles in Hong Kong (available for $25,000HKD each from Fine Vintage HK), we didn't crack open the one in front of us, but rather tasted from a sample bottle Richard had brought along. Nose: Furniture polish, neenish tarts, leather, sweet caramel chews, blackcurrant, orange spice. With more time, a little smoke and just the slightest hint of oak, but overall, quite fresh and very complex. 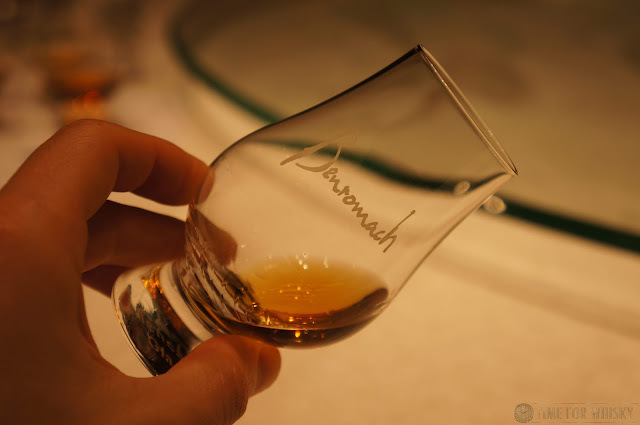 Palate: Initially quite sweet, settling into notes of super clean sherry. No sulphur here! Vanilla cream drizzled with Oloroso sherry. Hints of creamed honey. Dark chocolate. After time, a slightly earthy, peppery smoke. Finish: Long, sweet and slightly smoky (earthy / vegetive smoke). Slight tannins at the very end, and a lingering sweetness. Rating (on my very non-scientific scale): 94/100. Complex and beautiful - two characteristics that, when brought together well, produce an utterly fantastic whisky in my opinion. It was fantastic to sample the 1974 41yo, but it was also great to revisit some of the core lineup too, and to do so with a member of the G&M legacy. 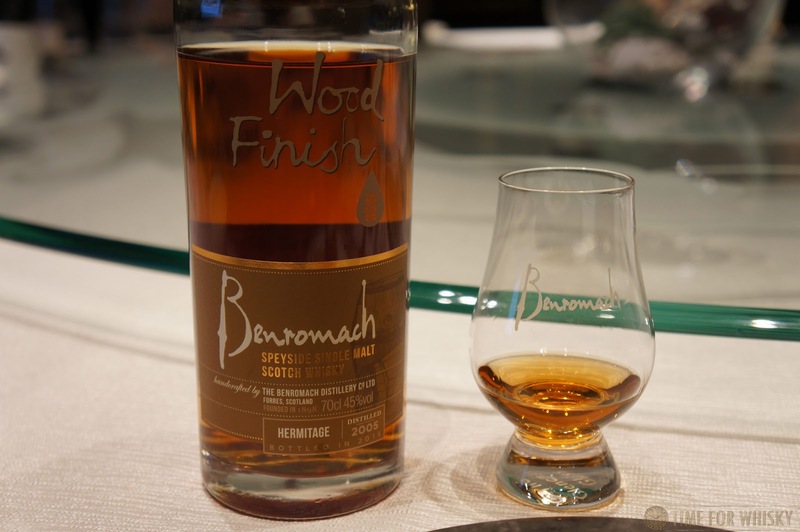 I've always enjoyed Benromach, but enjoyed it even more this time around. 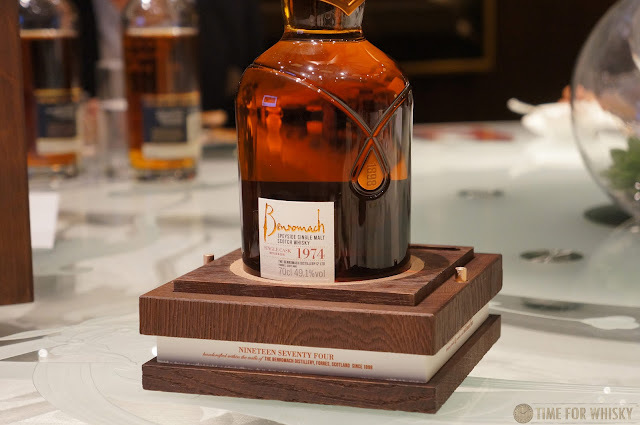 I'd go so far as to say the 10yo would be one of the best value Speysiders around that age on the market, and the 1974 - well, if you have $25k HKD you're thinking of spending on whisky, it would be a good way to spend it. TimeforWhisky.com would like to thank Richard and GHCAsia for a fantastic lunch and tasting.